OK....here is what a scene, any scene, would more or less look like to us as observers in 'infrared' if we eliminated the visible light wavelengths. The point I am trying to make is that when most people talk about infrared photography they are often under the mistaken impression that it represents what we would see if we (humans) could see the infrared portion of the electromagnetic spectrum. But, of course, we can't. So if we were relying on the infrared portion of the spectrum to see....well, we wouldn't see very much. So what are we seeing when we look at infrared photographs? Well, we are looking at how the infrared film or the digital sensor reacts to the infrared portion of the spectrum. It is how the film or sensor 'sees' infrared because infrared can be detected by them. That is to say, both are sensitive to the infrared portion of the electromagnetic spectrum. Our eyes are not. So when we look at an infrared photograph we are seeing the portion of the visible spectrum that the film or sensor has converted the infrared into. What we see is, by necessity, an interpretation. So what does infrared 'look like' to the several insects, snakes, and ferrets that can see this portion of the spectrum? Perhaps it gets philosophical, but I don't know and I'm not sure anyone truly can. These insects and animals were born with eyes that are sensitive to infrared so they probably don't think it is anything special! Perhaps it is like trying to explain to someone that has been blind from birth what 'yellow' is. 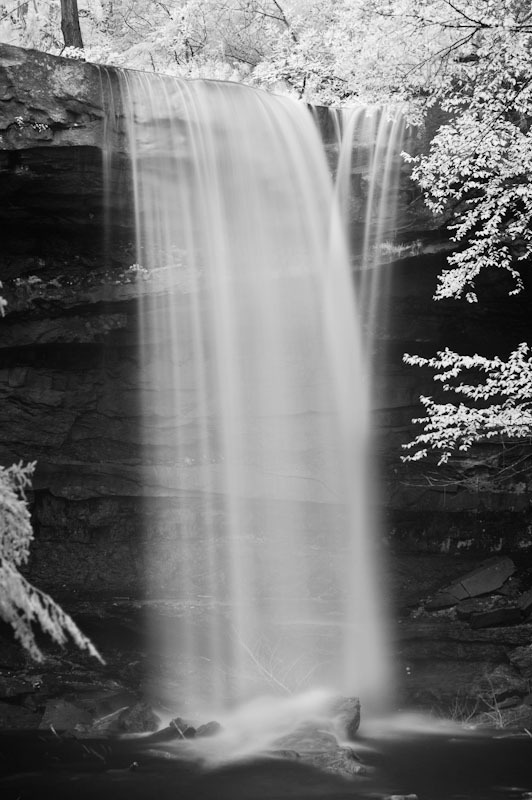 That said, here is an infrared digital image of Cucumber Falls at Ohiopyle State Park in Pennsylvania. At least this is how the digital sensor (with visible light filtered out) converts the scene to something that we can see.